There’s no telling of what people might be exposed to in the media nowadays, from graphic violence to sexually explicit contents. Having the ability to consciously be aware, and critical to the credibility of information provided or presented by the mainstream media has been an increasingly important subject in media education. 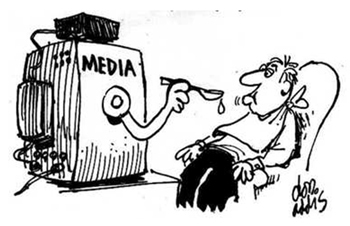 Media literacy is generally defined as the ability to access, analyze, evaluate and create one’s own messages in print, audio, video, and multimedia (Aufderheide, 1993). Access here would imply the ability to locate media from various sources i.e. television, radio, newspaper, and Internet. Analyze and evaluate would be to instill a critical thinking attitude whilst consuming media materials, understanding that not everything seen or heard can be trusted as credible information. Lastly to create means the ability to construct messages in variety of media forms to express their views and concerns about the issues facing them. The role of media literacy is to develop both critical understanding and active participations that enhances critical and creative abilities in young people. What this means is that consumers of the media should always maintain an active viewing mindset rather than being passively receptive towards everything that is being shown. It is important that young people must learn to spot a stereotype, distinguish facts from propaganda and important news from coverage. Noted researcher David Buckingham(2002) stresses that a more “hands on” approach with digital technology is a starting step in learning in an engaging and meaningful way. However, the attainment of this literariness requires a mindset that is capable of questioning and looking beyond the surface when evaluating information in terms of its sense of balance, bias and accuracy. In efforts to attain media literacy, a critical understanding of digital technologies; the ability to make and manipulate moving images will become more important than ever. The hands on approach such as that adopted in TMC Academy Mass Communication courses, in learning simply the art of working a camera, and how different shots and angles can produce different meanings aid to the development of media literacy. Once a person is exposed to such knowledge, the power of discernment then shifts to the audience or consumers. In this context, students of Mass Communications are given an opportunity to apply skills of critical analysis, thinking, synthesizing, evaluating knowledge, and attitude when digital tools are utilized. Consequently, media literacy can be considered as an essential surviving skill in this mass-mediated environment. *Part of this article is taken from a paper co-written by Aaron Rao & Dr. N.V. Prasad titled “Media Literacy in Post Graduate Video Productions”. Aufderheide, P (Ed.) (1993). Media Literacy: A Report of the National Leadership Conference on Media Literacy. Aspen Co: Aspen Institute. Buckingham, D (2002). The Electronic Generation? Children and New Media. Manchester: Manchester University Press.